Festivals, fairs, and events (FFEs) provide rural communities with economic and noneconomic benefits. For the project described in this article, we conducted a needs assessment of Iowa FFE managers by surveying them about the challenges they face in event management and then used the results of the assessment as the basis for training sessions provided to rural FFE managers in five areas of the state and development of an associated event management resource. The resource can be used by Extension and outreach offices to provide local FFE managers guidance on managing FFEs. We discuss broader implications for Extension as well. This article is published as Olson, E. D., & Rajagopal, L. (2018). 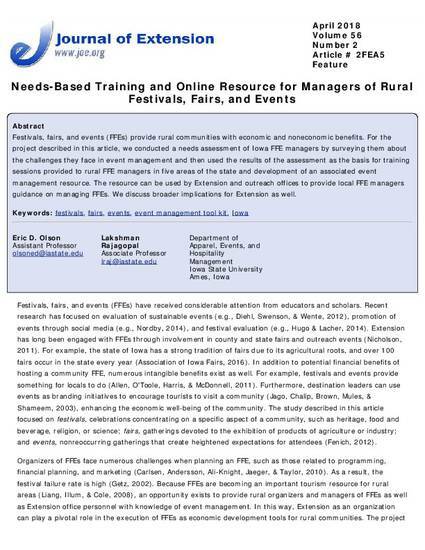 Needs assessment and development of a training toolkit for managers of rural Iowa fair, festivals, and events. Journal of Extension, 56(2); Feature / 2FEA5. Posted with permission.